Justice Ranjan Gogoi of Assam, who had previously practiced at the Gauhati High Court, made a powerful speech on Thursday at an event organised by the Indian Express Group by stating that “Democracy needs independent journos and noisy judges”. 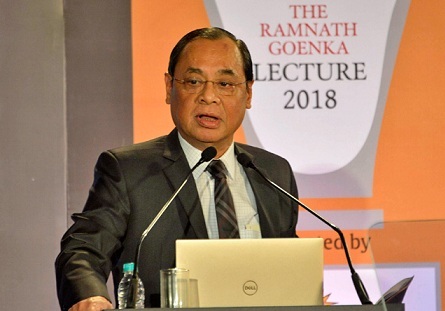 The Supreme Court (SC) judge, who is slated to become the next Chief Justice of India, was speaking at the third Ramnath Goenka Lecture at Teen Murti Bhavan, New Delhi, an annual event organised by The Indian Express Group to commemorate its venerable founder. Pointing out that there are “two Indias” which are at conflict, the report further quoted Justice Gogoi as saying, “There is an India that believes that it is the New Order and there is an India that lives below a ridiculously drawn Poverty Line on daily wages in night shelters with no access to education or healthcare, let alone access to the Courts of Law.” He feels that as there is a “huge disparity” between the two, the “Indian judiciary needs to do something about it”. The Supreme Court judge observed that “court processes are a trial even before the trial begins” and to fix this problem, the judiciary needs to be more “proactive and dynamic”. He doled out data vis-à-vis the sheer number of undertrials in prisons – “67 per cent of the prison population is people awaiting trial, mostly belonging to the underprivileged class and 47 per cent of them are between the ages of 18 to 30 years”. Gogoi stated that the said factors were “creating burden on the justice system not to speak about the issues of inefficiency, pendency and judicial vacancies”. The SC judge also said that he strongly believes in the fact that “as far as idealism is concerned, it should be pursued like an axiom”. Justice Ranjan Gogoi is known for ‘speaking out’ and he was in the news in January this year along with three other justices for allegedly holding an unprecedented Press conference, alleging problems plaguing the Supreme Court, failure in the justice delivery system and allocation of cases. He was also very much in the news with regards to the case of the death of special CBI Judge BH Loya. He is also one of the SC judges overseeing the National Register of Citizens (NRC) exercise in Assam.